[Donuts Subsidiary] is the top-­‐level domain name registry for [TLD Name]. Together with the other top-­‐level domain name registries in the Donuts family, the Registry is widening competition and choice in Internet identities through hundreds of new TLDs. The Registry in its sole discretion may amend the Terms and Conditions and Registry Policies from time to time. Auction means the auction to determine the prevailing Registrant when more than one Applicant submits an Application for the identical Domain Name. Auction Provider means the auction provider(s) published on the Registry Website, which may vary. AUP means the Registry’s policy regarding anti-­‐abuse and acceptable use of its Services, as may be amended from time to time, located at the Registry Website. Available Domain Names means a Domain Name that is not already registered or a Reserved Domain Name. Claims Notice means the notice Registrars must present to Applicants that their proposed Registration matches an entry, typically a trademark, in the TMCH. Confidential Information means any non public information that relates to the actual or anticipated business, research, or development of the Registry and any proprietary information, trade secrets, and know how of the Registry that is disclosed to Registrar by the Registry, directly or indirectly, in writing, orally, or by inspection or observation of tangible items. Confidential Information includes, but is not limited to, the Terms and Conditions, research, product plans, products, services, customer lists, development plans, inventions, processes, formulas, technology, designs, drawings, marketing, finances, and other business information. Domain Name means domain name in and maintained by the Registry’s database consisting of at least the SLD and TLD together, separated by a dot (e.g., “second.top”). Donuts means Donuts and its affiliates, including the Registry. Donuts Basic Access means access to the Sunrise and General Availability Services. 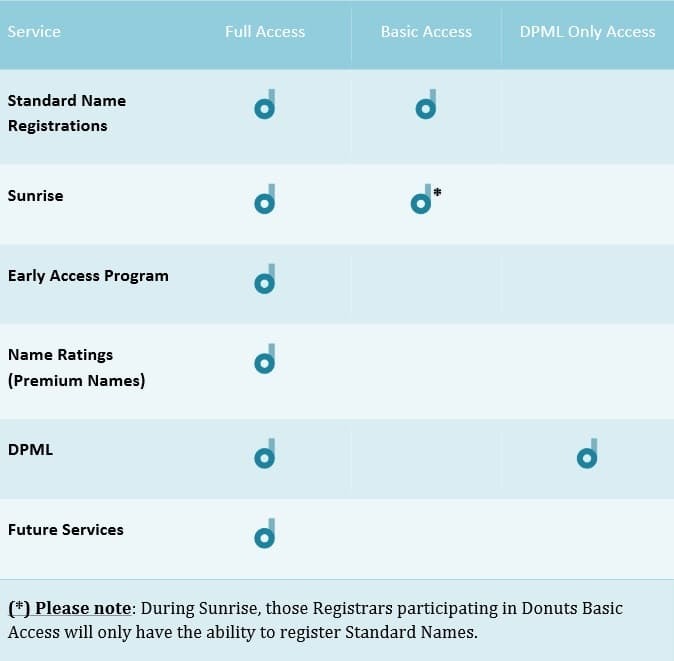 Donuts Full Access means access to the DPML Block, Sunrise, Early Access, General Availability, and Name Ratings Services. DPML or Domain Protected Marks List means the service that blocks certain SLDs from Registration across Donuts TLDs pursuant to the Terms and Conditions. DPML Access means access to the DPML Block Service. DPML Application means an Application for a DPML Block. DPML Block means the block, upon certain terms and conditions, preventing the Registration of a SLD across all TLDs then owned and operated by Donuts (e.g., a DPML Block for “second” will generally block that SLD from being registered in a Domain Name in participating TLDs, such as “second.top”). DPML Only Access means access to only the DPML Block Service, as noted in Table 1.3.1. Early Access Program means the Service allowing Registrars to register Domain Names during the first days of General Availability as specified in the Timeline. Early Access Program Fee means the non-­‐refundable and one-­‐time fee charged by the Registry to the Registrar for each Registration made during the Early Access Program. General Availability means the timeframe in the Timeline during which Domain Names are generally available for registration by eligible Registrants. Name Ratings means the Registry’s categorization of Premium Name prices for Domain Names. Override means, consistent with certain terms and conditions, the Registration of a Domain Name where a DPML Block currently exists by a Registrant holding an SMD File that contains the SLD String that exactly matches the SLD String in the applied-­‐ for Domain Name. Premium Name is a Domain Name designated by the Registry, in its sole discretion, for non-­‐standard pricing. Registered Name means a Domain Name that has been registered in and is maintained by the Registry. Registrar means a Domain Name registrar sponsoring an Applicant for a Registration that is (i) accredited by ICANN and (ii) has entered into a Registry-­‐ Registrar Agreement with the Registry. Registration means a Domain Name and its associated information (e.g., WHOIS data) submitted by a Registrar that has been accepted by the Registry in accordance with the Terms and Conditions and the Registry-­‐Registrar Agreement. Registration Fee means the per annum fee charged by the Registry to the Registrar for the Registration of a Domain Name. Registration Period means the length of time a Domain Name is registered. Registry means [Donuts Subsidiary], the operating registry for [TLD Name]. Registry Policies means the rules, protocols, policies or procedures, including without limitation the Terms and Conditions and the Registry-­‐Registrar Agreement, adopted and/or amended from time to time by the Registry. Registry-­‐Registrar Agreement is the agreement between the Registry and Registrars, as amended from time to time. Reserved Domain Name means a Domain Name that has been set aside by the Registry pursuant to Section 1.6. Registry Website means donuts.co or any other URL directed from such website. RFC means the Request For Comment specifications located at ietf.org. Second Level Domain or SLD means second level domain, representing the String to the left of the dot preceding the TLD (e.g., in the Domain Name “second.top”, “second” is the SLD). Service is a service offered by the Registry to Registrars (e.g., Sunrise Registrations). SMD File is the file issued by the TMCH proving that the TMCH application data for one or more TMCH-­‐eligible terms-­‐-­‐typically a trademark-­‐-­‐have been successfully validated and entered into the TMCH database. Standard Name means the lowest-­‐priced and most common type of Domain Name made available by the Registry on a first-­‐come, first-­‐served basis. String means a series of alphanumeric characters, including dashes when not preceding or finishing the alphanumeric character set. For purposes of clarity, this includes Punycode conversions of IDNs. Sunrise means the period noted in Section 4 in which only holders of SMD Files may submit Sunrise Applications. Sunrise Application means the non-­‐transferrable Application for a Domain Name made during Sunrise. Sunrise Participation Fee is the non-­‐refundable and one-­‐time fee charged by the Registry to the Registrar for a Sunrise Application. Terms and Conditions means this document, including the annexes and any and all interpretative guidelines published by the Registry in relation hereto, as may be amended from time to time. Timeline means the graphic representation of the Services in Section 1.4. TMCH Guidelines means the then effective guidelines found at http://www.trademark-­‐clearinghouse.com. TLD means top-­‐level domain, representing the String to the right of the dot (e.g., in the Domain Name “second.top”, “.top” is the TLD). UDRP means ICANN’s Uniform Dispute Resolution Process, as applied and amended. URS means ICANN’s Uniform Rapid Suspension System. WHOIS means the publicly available and transaction-­‐oriented query/response protocol specified by RFC 3912 used to provide identifying information regarding Registrants on the Internet. WIPO means the World Intellectual Property Organization. Please note : The Registry will provide access consistent with its applicable obligations in the Registry Agreement. The dates and periods listed below are subject to change. All such changes to the Timeline for [TLD Name] will be posted on the Registry Website. During General Availability, Available Domain Names may be registered on a first-­‐come, first-­‐served basis. During Sunrise, Registrars sponsoring Applicants with one or more SMD Files have exclusive access to submit Applications for Registrations in yearly increments from one (1) to ten (10) years. If more than one Applicant submits a Sunrise Application for the identical Domain Name, the prevailing Registrant will be determined by an auction process, described at the Registry Website. During the Early Access Program, which typically occurs during the first few days of General Availability (see the Timeline), Registrars may purchase Available Domain Name Registrations by paying an Early Access fee for each Domain Name. Please note : Only those Registrars participating in Donuts Full Access will habe access to the SRS to register Domain Names during the Early Access Program. among participating Registrars in the Early Access Program, Domain Names will be available for Registration on a first-come, first-served basis. At any time, including Sunrise, Early Access, and General Availability, certain Domain Names will have non-­‐standard pricing. These Domain Names, called Premium Names, may be registered by Registrars participating in Donuts Full Access. (5) to ten (10) year period and then may be renewed for up to a maximum DPML Block period of ten (10) years. During General Availability, Applications for Registration of Domain Names will be processed and allocated by the Registry through Registrars on a first-­‐come, first-­‐served basis, subject to the Registry Policies and ICANN Requirements. All Available Domain Names will be open for such Registration. A Registrar sponsoring an Applicant can submit an Application for Registration, or may modify a Registration on behalf of the Domain Name holder. e) The Registrar has appropriate access (i.e., Donuts Basic Access or Donuts Full Access). Registrations Periods must be in yearly increments of no less than one (1) year and no more than ten (10) years, commencing on the date on which the Domain Name is effectively allocated by the Registry. 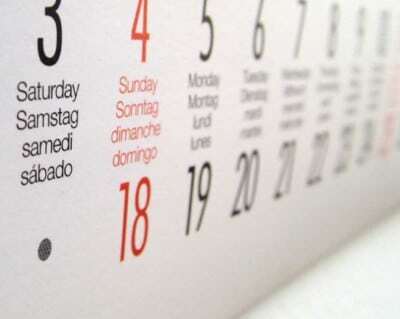 Unless otherwise terminated, such Registrations will expire on the same day of the month within which the Registration was created unless it was created on February 29, in which case it will expire on March 1. Unless otherwise specified by the Registrar to the Registry, the default Registration Period is one year. It is not the obligation of the Registry to notify a Registrant in advance of the termination or expiration (for any reason) of a Registration. The Registry shall be entitled, but not obligated, to immediately suspend or cancel any Registration that is in breach of the Terms and Conditions, the Registry-­‐Registrar Agreement, Registry Policies, or any other applicable law or regulation. The Registry may not accept an Application, and may not renew (including auto-­‐renew) a Registration at the end of its Registration Period, unless the Registrar complies with the Registry Policies. Registered Domain Names will auto-­‐renew, expire, terminate or otherwise be released from Registration in accordance with Registry Policies and ICANN Requirements. Payment of any fees due, for which the Applicant or the Registrant are solely liable, must be made to the Registry via a Registrar. The Registry is not responsible for any failure on the part of the Registrar in this respect, including where such failure results in non-­‐registration, non-­‐renewal or termination of the applicable Registration concerned. If the Registrant has paid the Registrar for a Registration or its renewal, the Registrar must perform the paid for action. Should the Registrar not perform such action, the Registry may in its sole discretion perform such action on behalf of the Registrant. Such action by the Registry will not relieve the Registrar of its responsibility for payment of applicable fees to the Registry nor will it serve as a waiver by the Registry of its rights against the Registrar for its material breach of its obligations under applicable policies. During Sunrise, Applicants with one or more SMD Files have exclusive access to submit Applications for Sunrise Registrations. Similar to Registrations, Sunrise Registrations may be purchased in yearly increments from one (1) to ten (10) years. Unlike Registrations that occur outside Sunrise, Sunrise Registrations are unaffected by Domain Names whose SLDs are under DPML Block; Sunrise Registrations will Override any Domain Names under DPML Block. If more than one Applicant submits an Application through a Registrar for a Sunrise Registration for the identical Domain Name, the prevailing Applicant will be determined by an auction process described at the Registry Website. The Terms and Conditions with regard to Sunrise Registrations comply with ICANN Requirements and TMCH policies; to the extent these Terms and Conditions conflict with such rules, the ICANN Requirements or TMCH policies govern. Each Applicant for a Sunrise Registration must include one or more SMD Files corresponding to the applied-­‐for Domain Name and must meet the qualifications specified by ICANN Requirements and detailed in the TMCH Guidelines, as they may change from time to time. Sunrise Applications may only be submitted by a Registrar sponsoring an Applicant and must include an SMD File corresponding to the SLD in the applied-­‐for Domain Name. The Applicant must first provide the information required by the TMCH to obtain the SMD File detailed in Section 2 and 3 of the TMCH Guidelines. e) The Registrar is eligible to make Sunrise Registrations (see Section 3.1). f) The SLD must contain at least one character. a) SMD Files submitted with Applications for Sunrise Registrations will be validated by the Registry as authentic. b) Sunrise Applications missing or containing an invalid SMD File will be rejected by the Registry. c) Sunrise Applications meeting Sunrise Registration eligibility criteria described herein and in accordance with Registry Policies will only become active Domain Names during the Rest Period noted in the Timeline following Sunrise. d) Sunrise Applications remain subject to review by the Registry in accordance with Registry Policies, and will only be registered in accordance with ICANN Requirements and the Registry-­‐Registrar Agreement. e) If more than one Sunrise Application is received meeting the eligibility criteria described herein for the same Domain Name during Sunrise, all such Applications will be submitted to the Auction Provider, who will notify the Registry of the winner of the auction in accordance with then-­‐published Auction Rules. f) Domain Names awarded to successful Sunrise Applicants will resolve when activated by the Registry typically within seven (7) days of notification by the Auction Provider. d) The Sunrise Applicant or Registrant accepts and will abide by the Registry Policies. Each Sunrise Application incurs a Sunrise Participation Fee. Sunrise Registrations must be purchased in yearly increments of no less than one (1) year and no more than ten (10) years, commencing on the date on which the Sunrise Registration is created by the Registry. Unless otherwise terminated, such Sunrise Registration will expire on the same day of the month within which the Registration was created unless it was created on February 29, in which case it will expire on March 1. Unless otherwise indicated to the Registry by the Registrar, the default Registration period is one year. a) The Registry may publish all or any portion of a pending Sunrise Application (e.g., via WHOIS). b) The Registry will notify all Registrars sponsoring Sunrise Applications applying for the same Domain Name of pending Auctions for such Sunrise Applications. c) Registrars receiving notice of a pending Auction must pass on such notice to their Sunrise Applicants. e) The Registry will notify the TMCH of successful Sunrise Applications once the corresponding Sunrise Registration has been activated. b) The Registry, in its sole discretion, has reasonable assurance of payment. During the Early Access Program, Registrars may purchase Available Domain Names by paying an Early Access Fee for each Domain Name. Applications during Early Access may be submitted for any available Domain Names. Unless otherwise stated, all rules, process and procedures for Applications and Registrations apply to the Early Access Program. The cost to register a Domain Name during the Early Access Program is comprised of the Registration fee plus the Early Access Program Fee. Registration fees during the Early Access Program may vary based on the categorization of the Domain Names (i.e., Name Rating). Early Access Program Fees are set by the Registry and will typically descend each subsequent day during the Early Access Program. Please note : If a Domain Name is registered during the Early Access Program and later deleted during the Add Grace Period the Registration fee will be refunded but the Early Access Program Fee will not be refunded. Only Registrars with Donuts Full Access may submit Applications for Registration during the Early Access Program. Registrations during the Early Access Program will be allocated on a first-­‐come, first-­‐served basis. Domain Names awarded to successful Applicants during the Early Access Program will be permitted to resolve upon Registration and, in any event, concurrent with the launch of General Availability. The Registry has categorized its Domain Names into pre-­‐defined price tiers called Name Ratings. Currently there are twelve Name Ratings. The lowest priced Name Rating for a TLD is a Standard Name, and any higher-­‐priced Domain Names are Premium Names. Only Donuts Full Access Registrars may sponsor Applications for Premium Names. Unless otherwise stated, all rules, processes and procedures for Applications and Registrations apply to Name Ratings. Registration fees for Name Ratings will vary based on the Registry’s pricing of the Premium Name and will be communicated to the Registrar. Prices will span over several static Name Rating categories, with each category rated from the highest Premium Name of “AAAA” to a lower category such as “B”. The Registry may at any time (a) change the Name Rating category for any Domain Name, including between Reserved Domain Name and Available Domain Name statuses, and (b) add a new Name Rating category. Registrars that do not have Donuts Full Access will receive a failure response via SRS for attempts to register or manage Premium Domain Names. Only Registrars with Donuts Full Access may engage in Name Ratings to sponsor Applications for Premium Names. The Registry reserves the right to review WHOIS records to verify contact information of Registrants and DPML Block holders. It is the responsibility of the Registrar to ensure that, if an approved privacy or proxy service is used, the Registrant holding or licensing the Registration or DPML Block has provided truthful and complete credentials to their Registrar or DPML Registrar, as the case may be. Registrars must also ensure that Applicants have agreed to participate in and abide by any determinations made as part the Registry’s dispute resolution procedures, including without limitation the AUP, the URS, and the UDRP. Registrars, Applicants or Registrants found to have repeatedly engaged in abusive registrations or practices, their agents or parties determined to be acting in concert therewith, may, at the Registry’s sole discretion, be disqualified from maintaining any current or future Registrations or DPML Blocks in any Donuts registry, including the Registry. Except as otherwise limited in the Registry Policies, the Registry may amend the Terms and Conditions from time to time, which amendments will take effect at the time they are published on the Registry Website, without prior notice to Registrars, Registrants, DPML Block holders or Applicants. The Registry may furthermore issue interpretative guidelines on the Registry Website regarding the Terms and Conditions. If any part of the Terms and Conditions is found invalid or unenforceable for any reason, the remainder of the Terms and Conditions shall be valid and enforceable as if such provision was not included therein. The invalid provision shall be substituted for any such provision that, to the extent legally possible, comes nearest to the sense and purpose of the Terms and Conditions. To the extent permitted under governing law, the Registry shall only be liable in cases of proven willful misconduct or gross negligence. In no event will the Registry be held liable for any indirect, consequential or incidental damages or loss of profits, whether contractual, based on tort (including negligence) or otherwise arising, resulting from or related to Registrations, DPML Blocks, or use of the SRS or Registry Website, even if they have been advised of the possibility of such loss or damages, including but not limited to decisions taken by the Registry to register or not to register a Domain Name on the basis of information from the TMCH. To the extent allowed under applicable law, the Registry’s aggregate liability for damages shall in any case be limited to the amounts specified in the Registry-­‐Registrar Agreement. The Registrar agrees, and represents and warrants that the Applicant has agreed, that no greater or other damages may be claimed from the Registry (such as, but not limited to, any fees payable or paid by the Registrar in the context of any proceedings initiated against a decision by the Registry to register or not to register a Domain Name). The Registrar agrees, and represents and warrants that each Applicant has further agreed, to submit to a binding arbitration for disputes arising from the Terms and Conditions and related to the allocation of Domain Name. The Registrar agrees, and represents and warrants that Applicants for Registrations or DPML Blocks, and SLD Registrants, have agreed, to hold the Registry harmless from claims filed or disputes initiated by third parties, and that each shall compensate the Registry for any costs or expenses incurred or damages for which they may be held liable as a result of third parties taking action against it on the grounds that the Applications for or the Registration, DPML Block, or use of the SLD by the Applicant infringes the rights of a third party. For the purposes of this Section, the term “Registry” shall also refer to its stockholders, directors, employees, members, subcontractors, the TMCH and their respective directors, agents and employees. The Registrar shall, and cause its agents and representatives to, safeguard all Confidential Information of the Registry or the Registry’s contracted parties, including without limitation the contents of the Terms and Conditions, but in no event less than the degree of care the Registrar uses for its own confidential or proprietary information of similar import. In addition, the Registrar shall restrict access to such Confidential Information to those of its agents or representatives who reasonably have a need to know such Confidential Information. The Registrar shall not use the Confidential Information of the Registry or the Registry’s contracted parties, except for purposes related to the performance of its obligations under the Terms and Conditions, Registry Policies, and the Registry-­‐Registrar Agreement. The determinations of the Registry and the TMCH regarding any Applications, DPML Applications, Registrations, or DPML Blocks shall be final and non-­‐appealable; provided, however, that such determination will not affect rights Registrars may have under applicable law, ICANN policies, or Registry-­‐provided dispute resolution procedures. The Registry and its affiliates (including Donuts), and their respective, managers, directors, employees, contractors and agents (including the TMCH and the Auction Provider) are not a party to any agreement between a Registrar and its Applicants, its Registrants or any party acting in the name and/or on behalf of such applicants or Registrants. Please note : Failure to include the applicable representations and warranties in Registrar’s agreement with Applicants and Registrants constitutes a material breach of the Terms and Conditions and Registry Policies, which may result in, among other things, transfer of Registrar’s sponsored Registrations and DPML Blocks to another eligible registrar.